You will find the species that have a given structure through the structure's Central Directory. Try it! 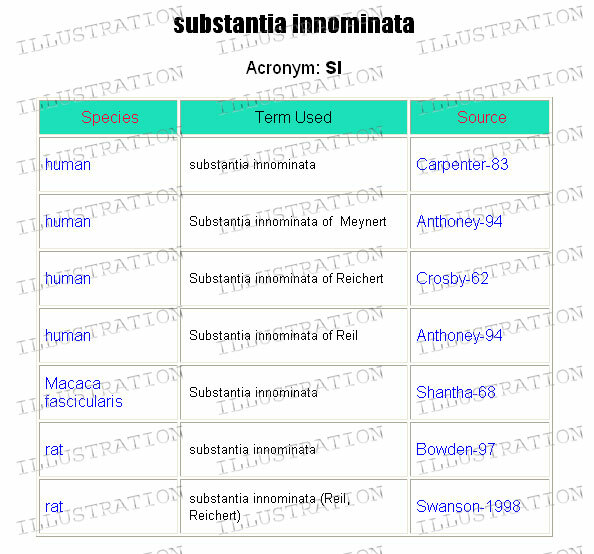 Find the species in which substantia innominata has been reported. For guidance on finding species that have a given structure Open BrainInfo Again in a separate window and navigate according to the instructions below. 1. Click 'Search by Name' in the green sidbar. 2. In the search box, type substantia innominata, and click 'Submit Query'. You will see that the substantia innominata has been called by several different names in three different species, including humans, rats and monkeys (Macaca fascicularis).